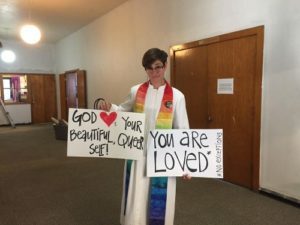 The Wesley Center at the University of Iowa affirms, advocates for, and celebrates queer and trans lives and loves as holy, sacred, and sources of divine delight. Discriminating against and marginalizing LGBTQ students is not only illegal, it is unethical, immoral, and an affront to Jesus’ teachings of radical hospitality, justice, and love. We are delighted to have LGBTQ students active in our spiritual community and religious programming. We recognize the ways homophobia and transphobia inflict spiritual violence against LGBTQ people. They are not Christian values and do not deserve any institutional protection. Disguising anti-queer sentiment as “protecting religious liberty” is manipulative, and a perversion of the anti-discrimination policies intended to protect those who face systemic marginalization and oppression. We remain committed to doing everything in our power to resist and undermine racism, sexism, homophobia, and every manifestation of xenophobia that diminishes our relationships with one another and with God. We are grateful for the courage of the student whose leadership was denied by the group in question, as well as the leadership of Dean Lyn Redington, Assistant Dean Thomas Baker, and IMU Executive Director William Nelson. The Wesley Center unequivocally supports them, as well as every staff, faculty, and student working to make the University of Iowa and the broader world a more just, more compassionate, more loving place.